Newark, CA: The Bay Area American Muslim community celebrated the 4th of July with great enthusiasm and fervor. One of the major independence day events was held by the American Muslim Alliance and Pakistan American Democratic Forum (PADF) at the Chandni Restaurant in Newark that attracted a large number of people from distant cities. The program began with the recitation of the Holy Quran by Mr. Waleed Ali. Later, Mr. Saadullah Lodhi presented the first verse of the Holy Quran with its English translation. Ms. Samina Faheem, AMA National Coordinator, welcomed the guests on behalf of the PADF, and informed the gathering that ‘today we have gathered here to celebrate the independence day of our great nation.’ She said that America is described as a melting pot where people of different cultures, ethnic backgrounds and religions are galvanized to make it one great nation. But, Ms. Samina Faheem, believes that America is a big beautiful salad bowl with each component having its own color, texture and flavor. 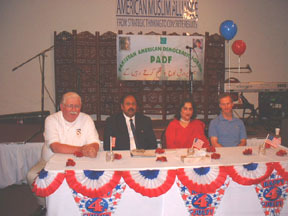 “We do not have to become a melting pot but could remain like a salad bowl.” Picture shows from left: Fremont Mayor, Mr. Gus Morrison; PADF Chairman, Dr. Agha Saeed; PADF Coordinator, Ms. Samina Faheem and Publisher and Editor of World Affairs Monthly, Mr. Thomas Pochari. Mayor. Gus Morrison was the main speaker at the function. Mrs. Moina Shaiq, member of the American Muslim Alliance Youth Think Tank Organizing Committee, introducing the mayor pointed out that Mr. Morrison describes himself as Fremont’s first recycled mayor. He served as mayor from 1985 until 1989, then returned to the City Council in 1991 and was again elected maor in 1994 and re-elected in 1996 and 2000. Mayor Morrison said that America is seen as a melting pot but we have never accepted diversity as a fact. He agreed with Ms. Samina Faheem that America is like a salad bowl, with each of its ingredients having a different taste. He revealed that 137 languages are spoken in Fremont but you don’t have any problem because kids don’t know the difference. Mayor Morrison expressed his appreciation of the Muslim community for its active participation in the City Council meeting about a resolution on the Patriot Act. The City Human Relations Commission has recommended to the City Council to pass a resolution to condemn the Patriot Act as it violates civil liberties guaranteed by the constitution. Mayor Morrison said that he believes that Patriot Act has renounced great chunks of liberties enjoyed by the people for centuries. But the City Council’s policy is that it should not take stand on national policy issues although other towns such as Berkeley have opposed the Act. However, on July 2, presentations from the community members were wonderful and he changed his mind. Now the City Council is redrafting the resolution to approve it. The Mayor said that one of the presenters said that you have taken oath to defend the constitution against foreign and domestic enemies. Ms. Reshma Yunus, member of the American Muslim Alliance Youth Think Tank Organizing Committee, introduced Mr. Thomas Pochari, Publisher and Editor of ‘World Affairs Monthly.’ He has traveled to more than 80 countries. In April 2002, the National Republican Congressional Committee appointed Mr. Pochari to serve on the Business Advisory Council.